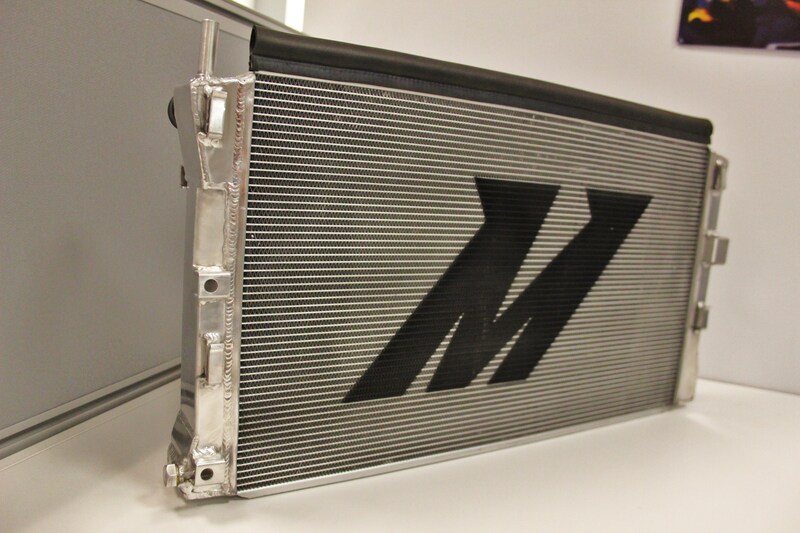 Interested in purchasing this awesome aluminum radiator? Check out more details on our product page linked below! We’re back with another prototype! After fitting our first unit, we found a few areas of our design that required minor adjustments to fulfill our goals of perfect fitment and optimal heat transfer. 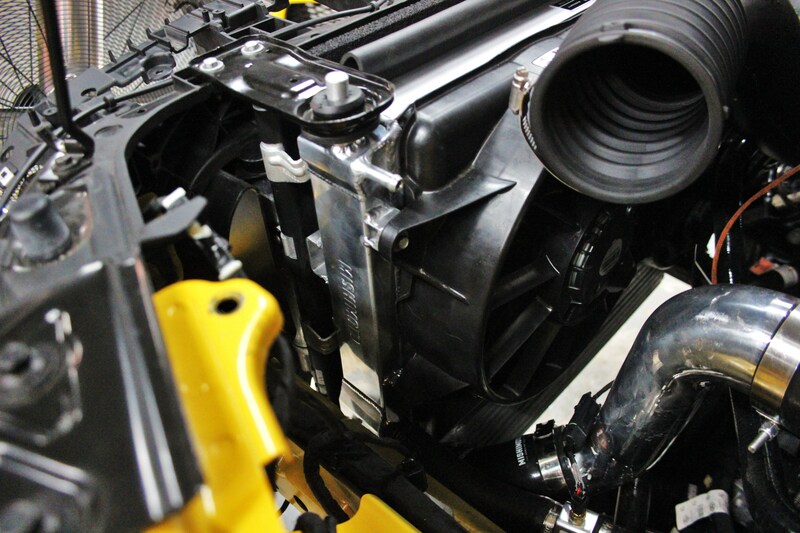 Our new 2015 Mustang EcoBoost parts are nearly complete! 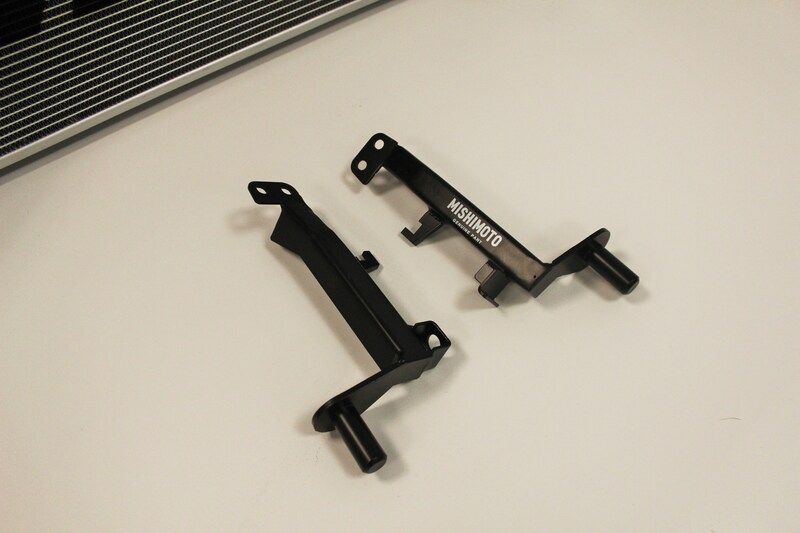 As noted in our previous article regarding the EcoBoost Mustang (EBM) radiator, we wanted to make modifications to both the core and our lower mounting brackets. These were easy changes, and we now have the second prototype shown below! Check out a look at the back-side of our prototype! The image above shows the new two-bolt bracket mounts on the base of the end tank, which will still incorporate our stamped logo. Notice the upper weather stripping that emulates the stock setup for an appropriate air seal with the stock plastic radiator cover. Check out a close-up of our new lower brackets! Time to bolt this piece into our EBM so that data collection could begin. Here are a couple shots of the prototype installed! 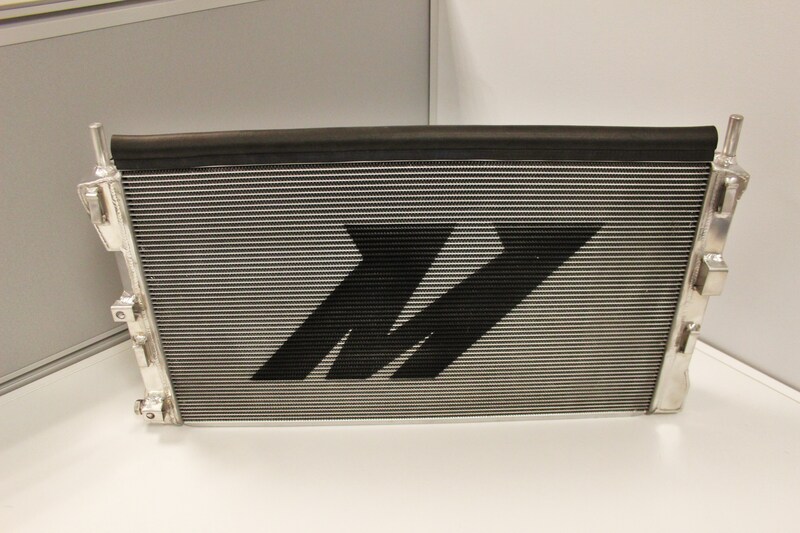 We’ve kept you guys informed of the changes we made to our radiator to improve cooling efficiency. 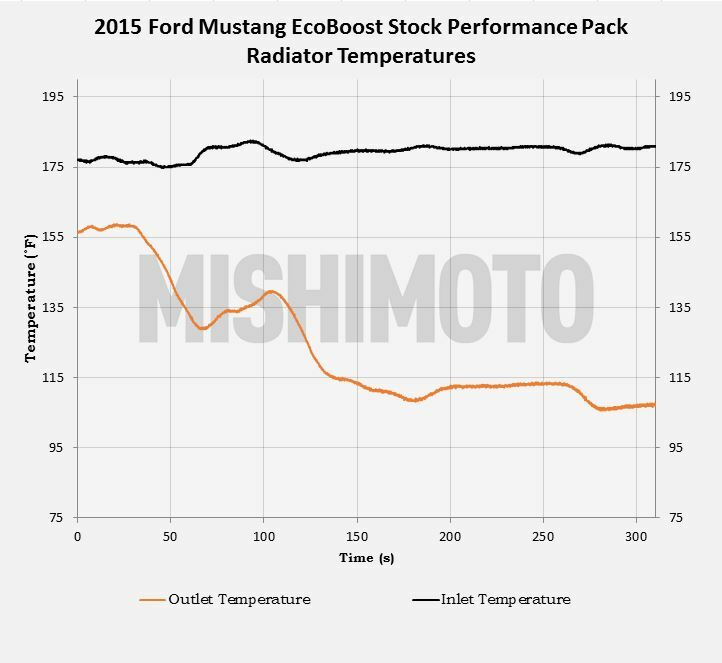 Track days can create quite a bit of under hood heat, and we want our 2015 Mustang radiator to be an effective solution for limp-mode activation by excessive coolant temperatures. What’s all this mean? This, my friends, is what we call an efficient radiator design. By packing more fins into the radiator, we are able to increase the contact points between external fins and the tubes that carry coolant. By doing so, heat transfer is greatly improved, which in turn results in more efficiency. 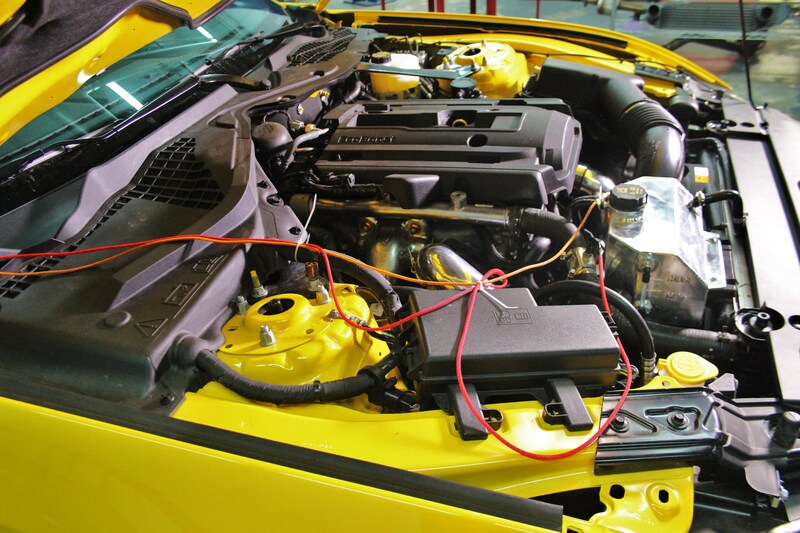 In addition, our larger capacity will improve heat dissipation and will also play a role in lowering coolant temperatures under high-stress driving. 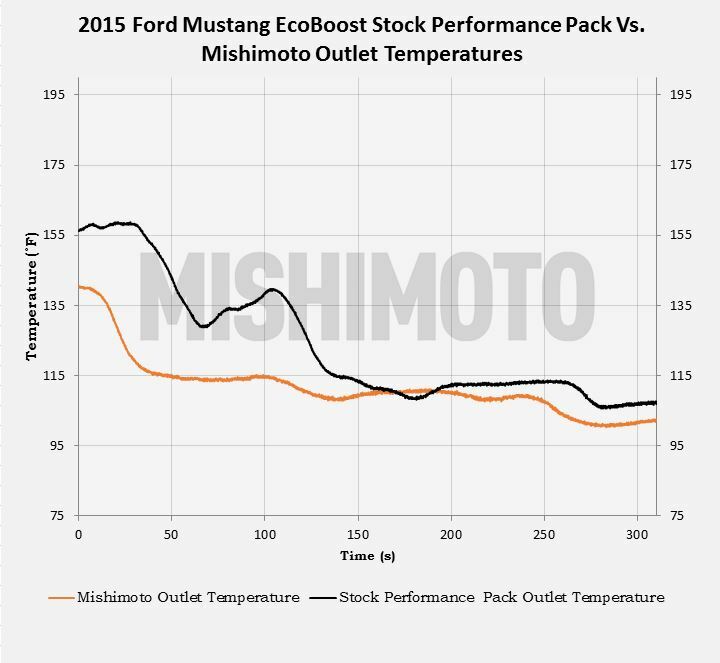 Below are a few charts that put a percentage behind the gains we see when comparing the base-model radiator, the performance package radiator, and the Mishimoto radiator. The chart above is a reflection of the improvement in external fin area. With a larger core and more dense fins, we’ve increased this area by 50% compared to the performance package radiator. Coolant surface area is a measure of the tubes within the radiator. With our thicker core, greater number of cooling tubes, and 3-row design, we’ve provided an increase of 22% in coolant surface area compared to the performance package radiator. So let’s see how these improvements will have an impact during our on-road tests! Woohoo! Let’s row through the gears of the MT82, melt through the Pirellis, and hit the highway! But wait, we have to install our data collection equipment first. 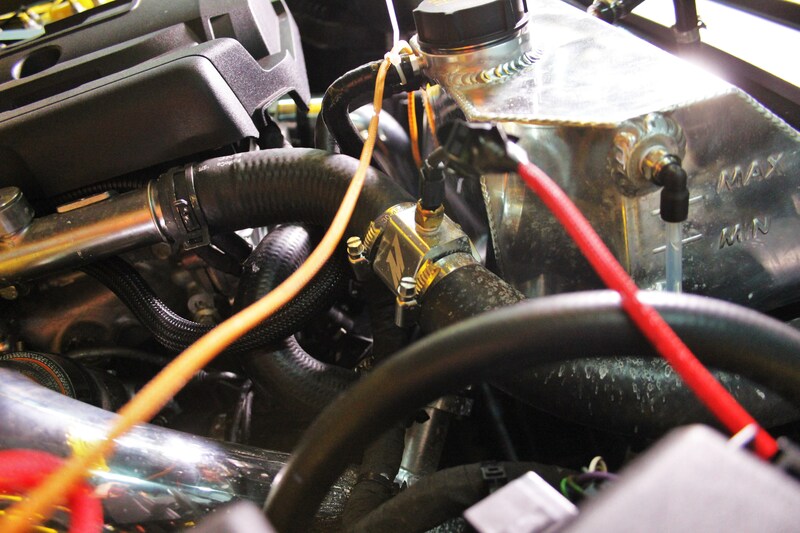 We installed our sensor adapters in both the upper and lower radiator hoses, which will allow us to capture both pre-radiator and post-radiator coolant temperatures. Check them out! First, let’s see how the performance package radiator performed in the conditions shown above. Inlet temperatures hovered around 175°F–180°F during our steady-state cruise, likely regulated by the coolant thermostat. Outlet temperatures started at approximately 160°F and took around 2.5 minutes to settle down into the 110°F range. Fairly impressive for a thin stock radiator, but this is to be expected based on the absence of stress on the system. With higher temperatures and high engine rpm, we would likely see much different results. Next up, the Mishimoto radiator. 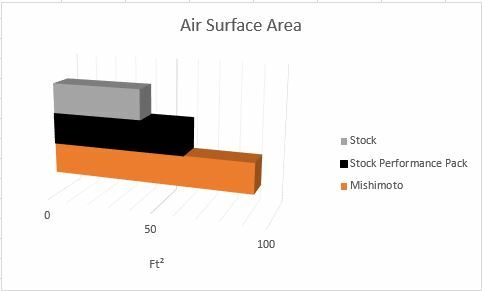 Inlet temperatures are identical to those of the stock radiator, but we do see a difference in our outlet temperatures. Almost immediately, temperatures drop to 115°F and continue to drop below 105°F. Let’s take a look at these plots on one chart. So what do we gather from this data? 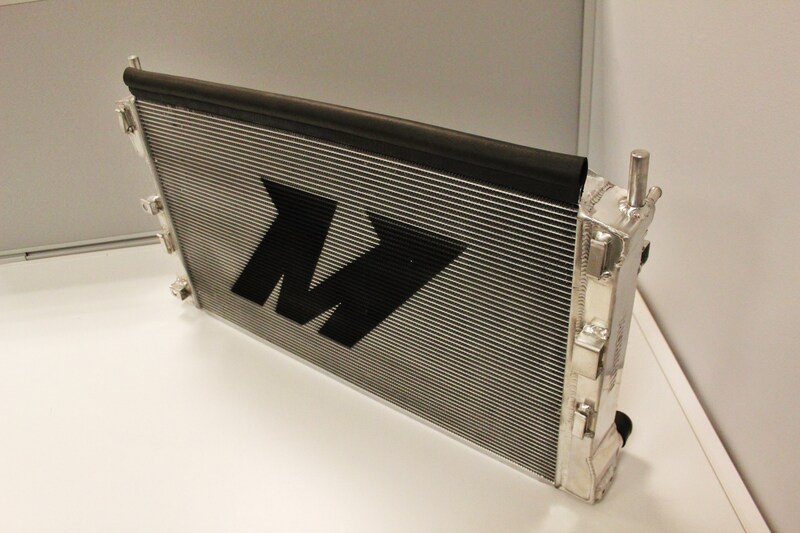 Well, the Mishimoto radiator has a much quicker reaction to airflow, thanks to the improved heat transfer. 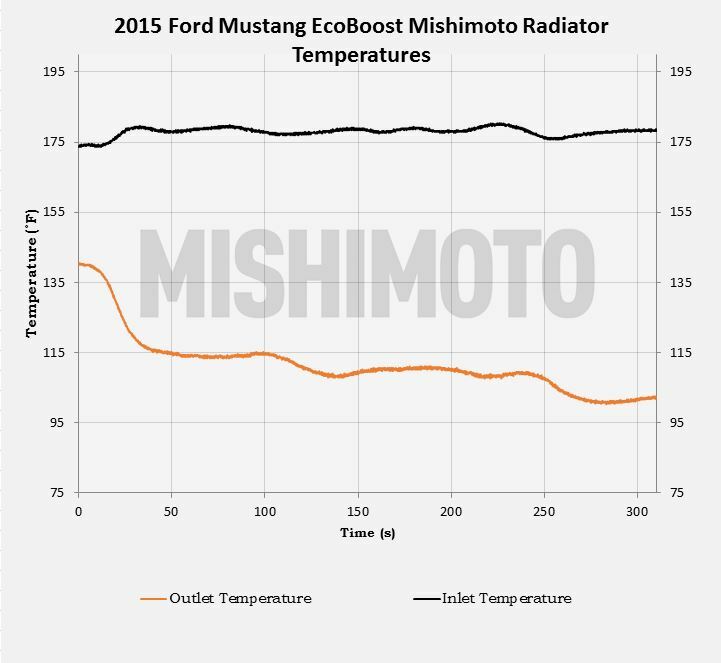 On average, our radiator provided a 6°F drop in coolant temperatures. Not a huge drop, but consider the testing conditions: We did not put stress on either system. In a track situation, the drop in coolant temperature would most likely be far more substantial. 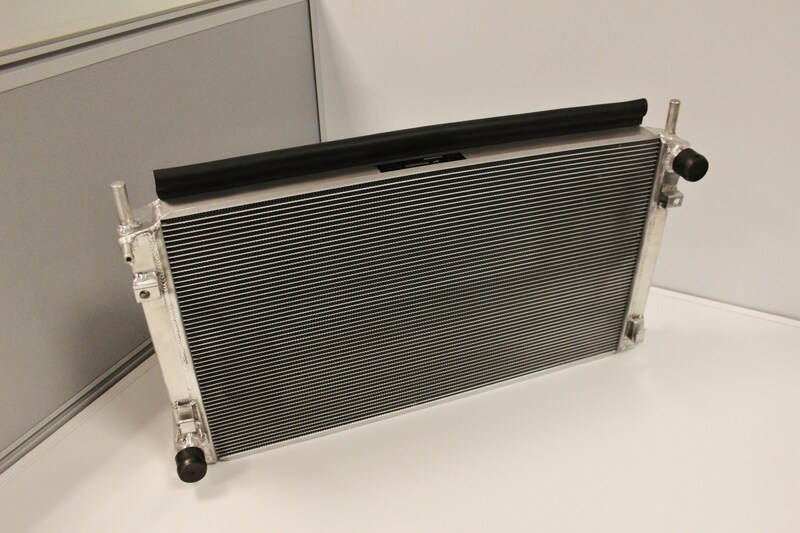 In conclusion, we are very pleased with these results from our new 2015 Mustang parts, and we do expect this radiator to adequately cool a vehicle in extreme conditions on the track. 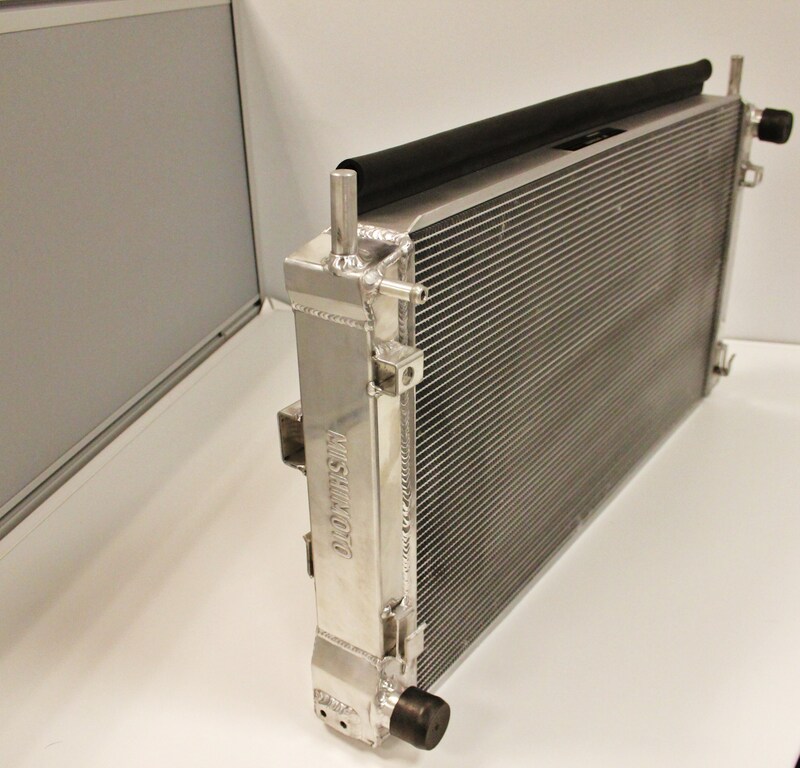 In addition, this testing was completed with our prototype against the larger performance package radiator. Temperature drops against the base-model radiator would likely be even greater. Time to thank our followers! Knowing that we have an awesome product with positive testing results, it is time to launch a discounted pre-sale for those who have been following our progress. Check back soon for information regarding our introductory pricing as well as a timeline for shipment! 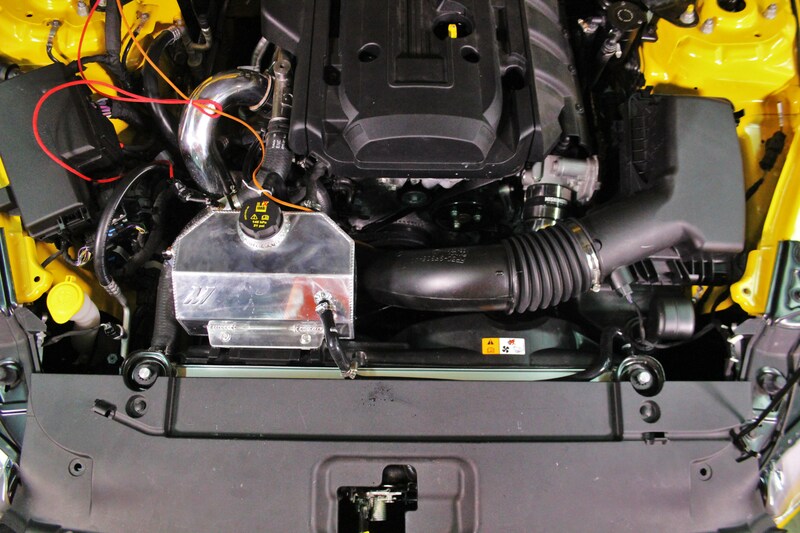 Be sure to keep an eye on our blog for more new 2015 Mustang EcoBoost parts!